Ferrari 488 GTB Performance, Engine, Ride, Handling | What Car? The Ferrari 488 GTB is, unsurprisingly, exceptionally fast. Ferrari claims 0-62mph in 3.0 sec, and we’re not inclined to doubt it. The clever bit, though, is the manner of the V8’s delivery. In order to avoid feeling overtly turbocharged, it slowly and progressively builds the torque output, meaning there’s actually more amenable, low-down pulling power available in the higher gears than there is in the first few. This helps to retain the character of a proper hard-driving and high-revving Ferrari engine, as well as making the 488 surprisingly easy to drive. It will, for example, accelerate (very briskly) from 30mph in sixth gear, and doesn’t require the dual-clutch transmission to downshift from seventh on the motorway to execute very prompt outside-lane overtaking. Okay, the 488 doesn’t sound quite as glorious as Ferraris of yesteryear, but that 3.9-litre V8 engine still makes a hell of a noise. It's the added usability that really marks the 488 apart from its predecessor, the stellar 458. Yet, to drive, both cars have a familiar identity to the 488. The new model’s steering remains amazingly quick and responsive, and is connected to a chassis that performs a similarly remarkable change of direction. Crucially, this doesn’t happen with the slightly unfeeling, stability-biased four-wheel-drive Lamborghini Huracán, but with a finesse that gauges body roll, weight transfer and rate of response to the point of near perfection. 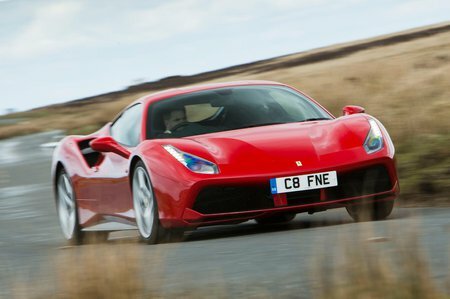 Much of the car’s cutting-edge tech – including the latest E-Diff and F1-Trac traction control system – is dedicated to the business of making the 488 manageable without strangling the involving and very lively handling one would expect of a Ferrari. In this respect, the Italian manufacturer is second to none. It even rides remarkably comfortably for a supercar – especially if you press the aptly named ‘bumpy road’ button on the steering wheel.